Fayetteville notched their sixth win of the season on Saturday night as they knocked off the Myrtle Beach Pelicans 6-4. While the final score may make it seem as if the game was close throughout, the Woodpeckers pitching staff had held Myrtle Beach to only a single base-hit through the first 26 outs of the evening. The Pelicans scored four runs in the ninth, all with two outs, to put a scare in the Woodpeckers before Fayetteville was finally able to finish the game. 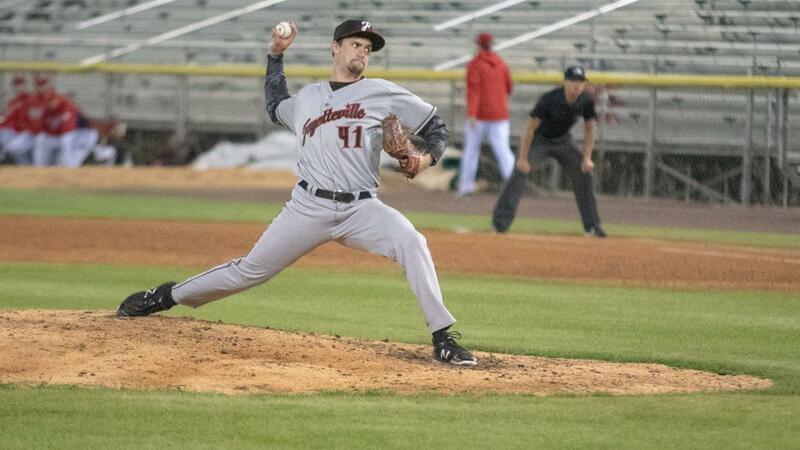 Following his career-high 11 strikeout performance a week ago, Peter Solomon was able to keep the Pelicans off the board over the course of his start, but a high pitch count forced Fayetteville to go to the bullpen in the fourth inning. Cesar Rosado (1-0) took over to start the fourth and logged 2.2 scoreless innings without surrendering a hit. Following Rosado, Joey Gonzalez, making his debut at the full season level, pitched beautifully. The right-hander logged three scoreless frames, following Rosado's example by not surrendering a base hit. The night finally got started in the fourth inning, when Corey Julks lead off the frame with his first home run of the year, a shot just over the left field wall. After the home run, Pelicans starter Javier Assad (0-2) continued to unwind, allowing two doubles and a single before being lifted in the fourth inning with two runs on his ledger. Fayetteville wouldn't score again until the seventh when Jonathan Arauz lead off with a double, advanced on a groundout, and eventually scored on a wild pitch to make it 3-0, but the eighth inning was where the offense finally found itself. In the penultimate frame, five of the first six batters to step to the plate reached base safely, scoring three insurance runs in the process. Those insurance runs would prove necessary in the ninth. With the Woodpeckers one out away from the win, Tommy DeJuneas was summoned from the bullpen to record the final out, but the Pelicans simply would not let him. Each of the first five batters to face DeJuneas all reached safely, highlighted by a pair of doubles. All-in-all, four runs were scored, all with two outs. With a tying run at the plate in Wladimir Galindo, DeJuneas was finally able to lock in and strike out Galindo with a breaking ball down and away. With the win, Fayetteville re-enters a tie for first place in the Carolina League South Division, knotted with the Carolina Mudcats and the Down East Wood Ducks, all three at 6-4 on the year. The Woodpeckers will have an opportunity to maintain that first-place position, and win the series in Myrtle Beach when game four gets underway starting tomorrow at 6:05PM, Cristian Javier is scheduled to start for Fayetteville, hoping to add on to what's been six scoreless frames to open the year.